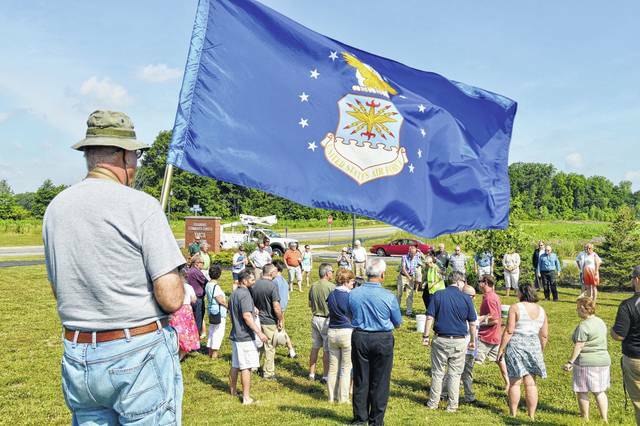 The U.S. Air Force flag is waved while the DiGenova family conducts the first mulching of an oak tree planted yards away from the DiGenova Way sign. The tree is another honor dedicated to the late Joe DiGenova, who represented the 3rd Ward on Delaware City Council. Vonnie DiGenova smiles after the unveling of a the sign for DiGenova Way, the new name for the road leading into the Delaware Community Center YMCA from Houk Road. It was named in honor of former Delaware City Councilman Joe DiGenova, who served for 25 years. Joe DiGenova died in March at the age of 71. The memory of 3rd Ward Councilman Joe DiGenova is still fresh in the hearts and minds of his family, friends, and many residents of the city of Delaware. The late councilman died in March at the age of 71 after being ill for several months. His legacy was honored Saturday with the renaming of Veterans Drive to DiGenova Way at the Delaware Community Center YMCA off of Houk Road. “He would be very humble about naming a street after him,” his wife Vonnie DiGenova said. Delaware Community Affairs Coordinator Lee Yoakum highlighted several of Joe DiGenova’s accomplishments, including the Veterans Memorial Plaza project that he spearheaded. The memorial, located at the Delaware YMCA, opened on Memorial Day last year. DiGenova, a Vietnam veteran and a Bronze star recipient who served in the United States Air Force, served on council for about 25 years, the most combined years in city history. During that time, he was a member of six different boards or commissions; was city council’s liaison to Delaware Municipal Court and Delaware City Schools; and worked with four city managers, eight mayors, and 24 fellow council members. “One of Joe’s proudest moments was in 2014 when he was inducted in the [Delaware City Schools’] hall of fame,” Yoakum said. It was extra special since DiGenova was not an alumnus of the school district. DiGenova was “old school” when it came to measuring what was good for Delaware, City Manager Tom Homan said. It wasn’t about how many likes there were on Facebook, but whether the actions taken would make Delaware a better community, he said. “Thank you, Vonnie, for sharing him for all these years,” Homan said. Council appointed Jim Browning to replace DiGenova. He will run for election this November and, if successful, would serve the remainder of the term until November 2019. Mayor Carolyn Kay Riggle said she gets “choked up” whenever she hears Browning’s name instead of DiGenova’s during roll call at meetings. “Jim, I don’t think you can ever fill his shoes, but all we can try to do is the best,” Riggle said emotionally. Riggle still had DiGenova’s resignation letter on her kitchen counter, she said. She reread it Saturday morning and said council and the community meant so much to her former colleague. 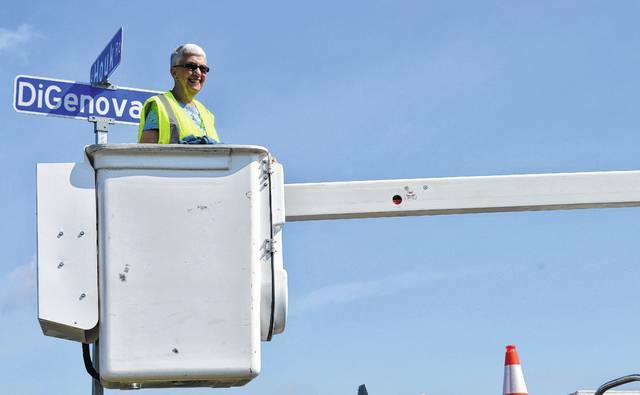 Vonnie DiGenova unveiled the sign bearing the new street name while riding in the bucket of a city utility truck. She and her family also conducted the first mulching of an oak tree planted a few yards away from the sign in honor of her husband, who once served on the Shade Tree Commission. “I’m not the talker my husband was. I have no funny jokes or stories about anyone,” Vonnie DiGenova said in her opening remarks. “But I have really the most wonderful kids in the world,” she added, her voice cracking. Her children Tom DiGenova, Tracy Feinberg, and Tim DiGenova, and her grandson Joey Feinberg, 14, helped out with the mulching. She thanked city council, Riggle, and Homan for their support after her husband’s death. “And for Lee — oh, I do have a story,” she said. It was about Yoakum’s alleged dislike of dogs and how at one time he cautiously petted her small schnauzer. Yoakum jokingly said it wasn’t the story’s true version. He told another story about Joe DiGenova being allowed to drink and eat anything he wanted with his doctor’s blessing when he was ill. DiGenova asked his wife to get a bottle of Miller Lite at a local drive-thru. “I don’t drink and I never bought beer and I said, ‘Joe, you’re going to make my mom and dad roll over in their grave,’” she said.